was born February 2, 1822 in Windsor, Connecticut. He enlisted in the Union Army at Canton, Missouri on December 4, 1861 for 3 years. 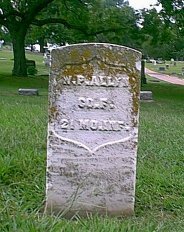 He was a member of Company F, 21st Regiment Of Missouri Volunteers. 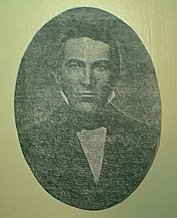 His regiment commander was Joseph T. Farris. He was wounded at Shiloh, Tennessee on April 6, 1862 during a fierce two day battle. This happened to be his first sons, first birthday. That day, he was sitting on a log, eating his lunch, when he was struck in the breast from a spent shell. He was knocked off of his log. He suffered hemorrhage of the lungs for several days. He also suffered from jaundice, chronic diarrhea, and dropsy. He was treated in the Regimental Hospital at Chewalla, Missippippi for two months. He was unable to recover fully from his injuries to resume active duty, so he was disharged on July 21, 1862 at Corinth, Mississippi. At the time of his discharge, he had elevated his rank to Corporal. William married his childhood sweetheart Mary Throop on April 30, 1857 at Litchfield, Connecticut. They had five children together. Amelia Marie, Mary Ellen, William Brainard, Helen Elizabeth, and Frederick Dan. William moved to Sioux City, Iowa about 1891, where he died on April 6, 1904 at the age of 83. He is buried at Floyd Cemetary in the Civil War Veterans section in Sioux City, Iowa. He has a civil war headstone, behind his headstone that reads: "W.P. Allyn, Co. F, 21 Mo. Inf." William's wife Mary lived to be over 100 years old. She died on May 8, 1935 in Washington D.C.
Biographical information was generously provided by Brenda Allyn.